Despite the fact that the sun emits a vast amount of radiation and appears to be in a state of strong convection, large parts of the solar interior remain stably stratified and exhibit layerwise two-dimensional motion. This occurs principally in the solar tachocline, situated about 0.7 of the solar radius. In this region, there is a three-way competition between rotation, stratification and electrical conduction/magnetism. This can be modelled by the equations of magnetohydrodynamics (MHD), essentially Maxwell's equations coupled with the Navier-Stokes or Euler equations of fluid dynamics. The flow properties in this region justify making the incompressible approximation and, moreover, justify neglecting the fluid viscosity compared to the magnetic resistivity (diffusion). This situation, corresponding to zero magnetic Prandtl number, is particularly difficult to model using conventional numerical approaches. 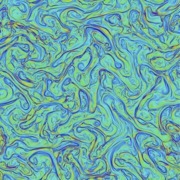 We have developed a unique method designed for two-dimensional or layerwise two-dimensional (stably-stratified) flow which circumvents these difficulties (Dritschel & Tobias, 2012). 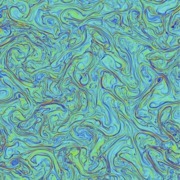 The method handles the inviscid fluid component by representing the potential vorticity by contours as well as a residual gridded field to account for the effect of the Lorentz force. 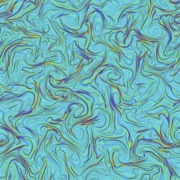 This residual field is frequently converted to contours to keep numerical diffusion at the lowest level possible (and much smaller than possible in conventional numerical methods, as shown in Dritschel & Tobias, 2012). We have recently explored the nature of two-dimensional MHD turbulence in the zero Prandtl number limit (see above paper and Tran, Yu & Blackbourn, 2013). 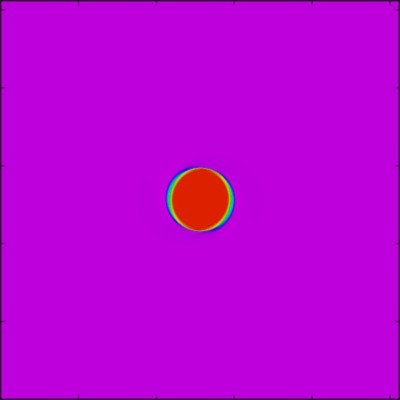 First of all, there is uniform convergence of the simulation results as the Prandtl number is reduced from 1 to 0. 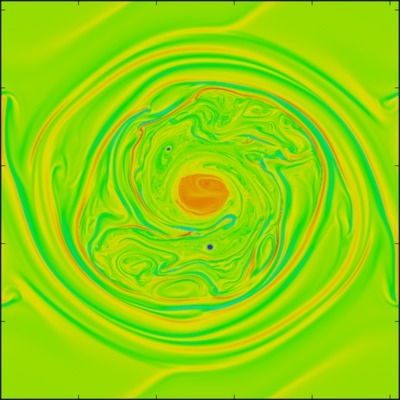 Secondly, as seen in the images above (upper right pair of images (vorticity and current density) for an initially very weak uniform magnetic field in the x direction, and lower left for a stronger field), the feedback of the magnetic field on the vorticity (left in each pair of images) depends essentially on a single parameter, γ, which is an estimate of the ratio (Eb/Eu)1/2 where Eb is the magnetic energy at maximum amplification and Eu is the kinetic energy at this time. The estimate for Eb is given by the initial magnetic energy multiplied by the magnetic Reynolds number Rm, as 'dynamo' action creates magnetic field through the twisting and stretching by vorticity. This is limited by the magnetic resistivity, so that Eb reaches a maximum in a freely-decaying turbulent flow. A full account of the mode interactions leading to dynamo action, or anti-dynamo action (field decay) may be found in Blackbourn & Tran (2012). 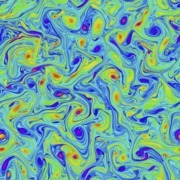 Another topic of current interest (in collaboration with Steve Tobias at Leeds) is the detailed feedback mechanism of the magnetic field on vorticity, specifically on circulation. 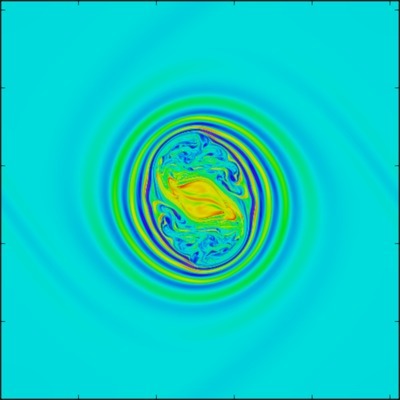 We have examined the dynamics of an initially circular patch of vorticity (vorticity evolution pictured above in the case of a moderate value of γ (= 2)), as well as elliptical patches and vorticity strips. In general, circulation is removed from the initial vortex as the field resists being wound up by the vortex. 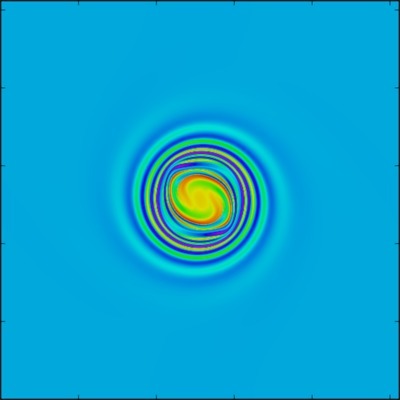 The way in which this occurs depends fundamentally on two parameters: γ and the diffusion length relative to the initial vortex radius (or characteristic length scale). Nevertheless, circulation always decays initially - the magnetic field 'takes the twist out of the vortex', and sometimes as pictured above can lead to a strong or total disruption of the vortex.